Congratulations to the team at VOX magazine led by Ruth Garvey-Williams and Jonny Lindsay for their January 10th anniversary edition. It is a remarkable achievement; the quality of production, done on a shoestring budget, is outstanding and the magazine has grown to be a unique place of news, discussion, reviews and reflections concerning Christianity in Ireland. Yes the Church is imperfect, it is full of imperfect people – I’m one for sure. Yes it is often divided relationally and theologically. Yes, there is much to be concerned about and lament over. Yes, it can be especially hard going in a local church when there is disagreement and division. But it was ever so – as a quick read of Corinthians and Galatians and James will remind us! The real challenge is to develop constructive criticism that builds up and does not just tear down. So at times I get a bit weary of endless criticisms of the local church – and have to watch that critical spirit in myself. This is why VOX has been, I think, a blessing to the church in Ireland. It has taken some risks to host debate – and the 10th Edition gives space to leaders talking honestly about challenges facing the Irish church. But it has also given voice to how the heartbeat of the Christian faith is ‘faith expressing itself through love’ (Galatians 5:6). Faith in Jesus, empowered by the Spirit, leads to a life that looks outwards from the self to others. And that is what I see in story after story in VOX. So thank you VOX for 10 years and best wishes for the ones ahead. Let’s start with emotions: at a deep level I’m dismayed and saddened. Christians believe that God alone is the life-giver. To take life is to assume the ‘right’ to destroy a precious work of God. But’s let’s also try to think what the result means more widely. I’ve only space to make two points on how I think the result poses profound challenges for Christians in Ireland today. First, the Referendum was about much more than abortion. A story is a powerful thing. I don’t mean story as fiction, but story as a narrative that carries moral, emotional and personal power. The story of the YES campaign was vote for compassion, safety, liberty, inclusivity, welcome and dignity for women faced with the traumatic situation of an unwanted pregnancy. It was a vote to cast off the last shackles of our religious past: its harshness, judgementalism, cruelty, abuse, enforced adoption, and systematic humiliation of vulnerable women by a patriarchal religious culture that used power for its own ends. This is why, for some Christians I talked to, the vote was far from a black or white issue but posed a real dilemma. It was also, I think, primarily the leaving behind of the final legacy of ‘old Ireland’ that thousands of people were on the streets of Dublin to celebrate on the 26th of May 2018. This means that in today’s Ireland, to use the language of John’s Gospel, it is the ‘world’, not the church, that embodies progress, hope and, most of all, love. And here’s the thing that churches really need to face up to and own – there is very good reason for the world to think like this. You don’t need me to re-tell the story of religion in 20th century Ireland. And let’s be honest, Protestant, evangelical and Pentecostal churches have plenty of repenting to do about our own divisions and lack of love. I often hear it said that Christians in the West now find themselves in a context similar to that of the early Church – as marginalised small communities of believers living within a pagan Empire. I think that’s partially true, but is too easy a comparison. The first Christians had no baggage of church history. Christians in Ireland, rightly or wrongly, like it or not, are perceived as carrying a truckload. The vote shows that a large segment of the population see that baggage as bad news, not good. Second, this means that the Referendum is primarily a challenge for the church to look at itself. Our job is not to ‘save’ Ireland – as if there is such a thing as a Christian country. The ‘world’ will do what the world will do and we cannot control it, nor should we try. No, our primary job is to be the church of Jesus Christ in the world. This means being authentic communities of love, grace and good news. Of serving others, of preaching the gospel, of forgiving each other, of welcoming the outsider whatever their history, sexuality or status. If we are against the taking of life in principle, it means being people of peace, not war and protecting and taking care of the elderly. When it comes to abortion, it means not only talking about it, but being communities of such generous love that a woman faced with a crisis pregnancy will be supported and cared for emotionally, financially and relationally so that the community can help her bring up her child. But we can’t do that from a distance. We need to ask ourselves, are we in nice holy huddles, detached from the experience of many women (and men) faced with abortion as the only ‘solution’ to their situation? Or are we taking the time, and bearing the cost, of loving people in need sacrificially? I’m troubled by my own answers to these questions. How about you? 1 Corinthians 13 is one of the most famous passages in the New Testament. It is also one of the most troubling. It is one particular aspect of the difficult and demanding nature of love that I want to focus on in this post. First, a wee bit of context. When read at weddings verses 1-13 are often sentimentalised. ‘Love’ is abstracted to be a ‘lovely’ description of the loving couple in a day celebrating their love. The fact that ‘God’ does not appear in verses 1-13 makes it a particularly suitable text for this type of abstraction. ‘Love’ is everyone’s property. You don’t have to believe in God to believe in love. The same goes for funerals. Prime Minister Tony Blair read these verses at Diana’s funeral in 1997. Now, I admit I find it hard to take Blair at face value in anything he says. But his overly-dramatic performance that day seems a good example of how ‘love’ in death is easily abstracted to become a sort of eschatological hope – that which ‘lives on’ after us when we are dead. Again, this hope is universal since everyone can love. But 1 Corinthians is anything but abstract; it is highly specific. Paul writes to a church riven by division, bad theology, pride, arrogance, immoral behaviour and misplaced priorities over gifts. So, as we read these verses they have a hard edge; there is nothing soft and fluffy about them. There are 7 positive descriptions of what love does and 8 negatives ones. A verb is used in every case – love is seen in what it does. Let’s take one example of a positive: love … rejoices with the truth (6b). It sits in opposition to love does not delight in evil. The verb has a sense of ‘joyfully celebrates’ or ‘acclaims’ truth’ At first reading this sounds lovely does it not? But think about the implications for a moment. In his NIGTC Commentary on First Corinthians Anthony Thiselton argues the emphasis here is not so much on ‘Truth’ with a capital ‘T’ (eg the truth of the gospel) as on relationship. Love rejoices in truth that protects, fosters and strengthens relationship, even at cost to ourselves. There can be powerful reasons NOT to rejoice in the truth. Last week the Church of England published a ‘report into a report’; namely a review of their own first investigation into how allegations of abuse had been handled by the Church. The independent review found that the first report has been ‘botched’ and that negative aspects were downplayed in order to protect the reputational character of the Church. This story has been unfolding for some time and appears to be in the process of coming to a head. You can read about the details fully in a recent post by Scot McKnight (who was a member of Willow for many years). Serious allegations against Hybels had surfaced some years ago and had not been dealt with openly then. When more women came forward, the reaction was denial, calling the women liars and failing to implement a robust external investigation. Now, at last, and only after enormous criticism and widespread concern both within and outside Willow, the elders and the two senior leaders have issued public apologies and promised to seek the truth. Both these stories are bad news and good news. They begin with the bad news of damaging behaviour. That was compounded by an instinctive reaction to hide the truth, or at least give a partial version of the truth in order to protect the institution in question. But the good news is that both are moving, at last, towards full disclosure. I mention these cases because they are current and in the (very) public domain. If postmodernism has taught us anything, it is to have a healthy scepticism over how institutions tend to act to protect themselves – and that, sadly, is true of churches as well. The tough calling of love is NOT to act in our own self-interest but in the interests of others, especially when there is a cost to ‘us’. In both cases, love meant first seeking the good of those damaged and hurt rather than using manipulation, obfuscation or obstruction to hide the full truth and protect ourselves. That’s why 1 Corinthians 13 is anything but a mushy feel-good ‘ode to love’, but is, rather, a very troubling and difficult text. If the Bible says little or nothing directly about abortion, then we need to reflect theologically on the issue, using the wider framework of the Bible’s rich teaching on God as the creator and author of life. Hundreds of texts proclaim God as one from whom all life comes into being. For example, this is true of the beginnings of both Testaments: Genesis 1-2 in the Old and John 1 in the New (where the ‘In the beginning’ of John 1:1 echoes Genesis 1:1). Through him all things were made; without him nothing was made that has been made. In him was life, and that life was the light of all mankind. (John 1:3-4). This means that life is not ours to do with as we will. Intentionally to end a pregnancy “is not only to commit an act of violence but also to assume responsibility for destroying a work of God” (450). (The abortion debate directly relates to other life and death questions around euthanasia, suicide as well as war and non-violence. To be consistent, Christians who are against abortion should I think also be committed to not taking life in those circumstances as well). In this framework, it is a distraction to get into arguments of when a foetus becomes a ‘person’ – he or she is a manifestation of the creative life-giving power of God. If all life is a gift and does not belong to us, this means that to end life is an extreme act. As Hays says, there might be extreme circumstances in which it may be warranted (I assume he has in mind here examples like fatal foetal abnormality or a major medical risk of the life of the mother) but such action would be very rare and require compelling evidence. To develop his argument, Hays gives three lines of metaphorical reasoning – three ways the theological world of the New Testament overlaps with the contemporary practice of abortion. The subversive double point of the parable is that (1) to love your neighbour means loving your enemy (2) it is the hated Samaritan who shows rather than receives mercy. In relating this to abortion, Hays argues that the point is not that the foetus is somehow a ‘neighbour’. Rather, it is that we are called to become neighbours to the weak, powerless and helpless. Like the Good Samaritan, to go beyond boundaries to offer life-sustaining care to those whom we naturally would not consider worthy of our compassion. Such life-giving care would go out to the mother in a ‘crisis pregnancy’ as well as the unborn child. Such an approach subverts legalistic questions such ‘Is the foetus a person?’ Hays is compelling here – such a question is like the lawyer’s to Jesus: ‘Who is my neighbour?’ He wanted to know so he could limit his obligation of care. Questions about the personhood of an unborn child have behind them a desire to limit obligation and care – ultimately by killing the life it represents if it is not ‘defined’ as a ‘person’. Let’s remind ourselves of Hay’s approach to thinking ethically about abortion. Hays is doing that here. This text is well-known. ‘There was not a needy person among them’. His point is that within the church there can be no grounds for abortion on economic grounds or on the incapacity for the mother to look after the child. Within the community of the people of God, sharing and love are the answer, not abortion. For the church to acquiesce in abortion on pragmatic grounds is to fail in its vocation to be a radical community that bears one another’s burdens. Church discipline is also relevant. Men need to be held responsible for children they father: by supporting the woman emotionally and financially; and by being there for the child as it grows up. Within the community of faith they do not do this alone – it can take a community to raise a child and support a family through love, support, prayer and encouragement. Hay’s third paradigm is the imitation of Christ (Rom 15:1-7; 1 Cor 11:1; Gal 6:2; Phil 2:1-11). The Christian life is cross-shaped. It means giving up rights for the sake of others just as Jesus did.t is a life lived in relationship with others, often at significant cost and inconvenience. Examples like these begin to shape imagination, thinking and behaviours that inform an authentically Christian response to the question of abortion. This is why the question of abortion for Christians is one that first challenges the church and its radical practice of welcome, care, generosity, community and love. For those in Ireland, how much have you heard this perspective articulated and discussed amongst Christians and churches in the Referendum debate? How would it change the debate? If it has been pretty well absent, why is this do you think? For a blog called FaithinIreland, Finding Faith in Ireland: The Shifting Spiritual Landscape of Teens and Young Adults in the Republic of Ireland is a publication that invites some comment. It is a Barna Report produced in partnership with Youth in Christ. Both are American organisations and the researchers, coming mostly from outside Ireland and working with people here, have done a very good job getting to grips with the complexities of the Irish religious landscape. It is a thoughtful, careful and objective summary and analysis. A summary of the main findings is highlighted on the Barna website here. (I won’t repeat that much here but will just comment on some things that stood out to me). It is well worth reading and for people in ministry to reflect on their implications. To understand the state of faith among Irish youth, Barna conducted a study that approached the question from several angles. In the first phase, Barna and Christ in Youth gathered youth workers from a variety of denominations for focus groups. In the second phase, four Irish interviewers spoke to young people and their youth leaders. Youth leaders who weren’t interviewed in person also had the opportunity to respond to the same survey online. The online youth study was distributed to young people in the Republic of Ireland, ages 14–25. A total of 790 youth participated in this research study. Based on this sample size, the sampling error for this study is 3.5 percentage points at the 95-percent confidence level. Practising Christians (with those identified as Christians, sometimes broken down between Catholic and non-Catholic Christians). With many of the findings divided between 14-18 yrs old and 19-25 yrs old groups. Which, of course, is a very broad category, especially in a culture where ‘going to church’ now and then is still part and parcel of Irish culture. But you have to start from somewhere. I may have missed it, but I couldn’t find definitions of what a ‘non-practicing Christian’ was. I assume someone who self-identifies as a Christian but does not tick necessary boxes to show visible sign of actual Christian practice? (To me, in effect this equals non-Christian. Christianity is not a non-practising faith). Non-believers are identified, I assume, via self-identification. Having two daughters in the age bracket born and raised here and educated in a local secondary school (not a private Protestant one which a sub-culture of its own), it’s interesting talking over findings with them. Their sense is that the broadness of the categories masks a much lower engagement with even basic Christian claims, let alone a personal response of faith, repentance and living a Christian life. This report could be called: ‘An Investigation into the Legacy of Irish Christendom’. 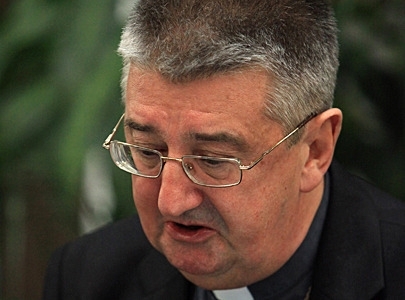 Some years ago I did a couple of posts on comments from Archbishop Diarmuid Martin on the devastating failures of Catholic Christendom – here and here. It’s worth repeating some of what he said then on the disaster of Christendom assumptions. So the report is effectively putting flesh on the bones of the Archbishop’s words. It does not paint a pretty picture. Nor are the findings surprising to anyone living here. After decades of being one of the most Christendom countries on earth, the findings show deep confusion over the even the most basic ideas of Christianity, let alone the shape and basis of the Christian life. The 19-25 age group will be more significant and realistic because the 14-18 yr olds’ attendance at church events will be influenced by parental practice and how religion is still embedded in the school system. I’ll focus on actual practices because they are somewhat more telling than abstract questions about belief in this or that doctrine which may or may not be understood. Yet 70% of the sample of 14-25 yr olds identify as Christian. Traditional Catholic practice is in deep trouble – only 13% and 14% of 14-25 yrs olds have prayed the rosary or go to Confession in the last 6 months. This will be lower again for 19-25 yr olds. This represents virtual abandonment of Catholic piety. 11% of 14-25 yr olds have read the Bible on their own in the last 6 months (again this will be lower for 19-25 yr olds). (The Bible is pretty well a closed book to the vast majority of young Irish people. Virtually nothing can be assumed about the basic outline of the gospel story or the storyline of Scripture). 8% of 14-25 yr olds have attended a Bible study in the last 6 months (again will be lower for 19-25 yr olds). Even for Communion – only 42% of 14-25 yr olds have participated in the last 6 months. For many this will be have been in school or at events like Easter of Christmas. For 19-25% it will be much lower I guess. Since the vast majority of these figures are for Catholic youth, even Mass attendance, the core of Catholicism’s sacramental theology, is in crisis. 1) God created the world and watches over humans. 2) God wants people to be good, nice, and fair. 3) The central goal of life is to be happy and feel good about oneself. 4) God doesn’t need to be involved in one’s life except when there’s a problem 5) Good people go to heaven when they die. Which is a question that raises more questions than answers: What Church? What aspect of its teaching on sexuality? (e.g. if Church = RCC [as it would for most] then I would be in the 31%). That only 31% of those identifying as Christians could endorse Church teaching fully does say a lot – but it would need teased out more specifically. A slightly less broad question. Throwing in ‘sexuality’ in again muddys the waters a bit. I suspect most answered on the issue of homosexuality. ‘Non-Christians’: 16% ‘not at all true’. 65% ‘completely true’. There’s lots more in the report. And, just to be clear, I’m not at all ‘throwing hands up in despair at the youth of today’. I have a vested interest in at least two 🙂 – and admire them and their friends as they navigate life with love and courage in a very different Ireland. Christendom in many ways was far more corrosive in its enforced hypocrisy and fusion of politics, identity and religion in an all-embracing package deal. Again and again in this report, the sense comes over of how ‘Christianity’ is little more than external behaviour, arbitrary morality and irrelevant beliefs. I wouldn’t believe in that sort of religion either. There is a lot more clarity and honesty being expressed as the fog of Christendom lifts. Post-Christendom is in many ways good news for Christians and Christian mission. Increasingly there is no comforting social and political bulwark for churches to rely on, let alone control. And that is not a bad place for the church to be – a place of weakness and humility and having to think anew about its mission within a culture that has less and less connection with its Christendom past. In the final section there are some suggestions around the need for spiritual guides and mentors.